The Antelopes finished the 2010 season ranked No. 11 in NCAA Division II and No. 2 in the West Region. They went 15-3-2 overall and 12-1-1 in the Pacific West Conference, winning their fourth conference title in five years. They advanced to the championship game of the West Regional before losing to host Chico State. All-America forward Kyle Ciliento, who scored 50 goals in his first two seasons at GCU, injured his knee in the spring and will miss the entire season. The Antelopes also will need to replace steady goalkeeper Ben Paneccasio. In exhibition play, transfer Saeed Robinson has demonstrated goal-scoring ability. ● Home opener: 8:15 p.m. Friday vs. Colorado State University at Pueblo. The Antelopes return junior midfielder Marina Nesic and senior goalkeeper Stephanie Phillips from last year’s No. 9-ranked team in the West Region. 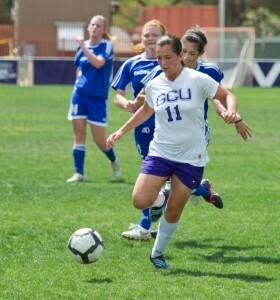 GCU finished 11-5-1 overall and 9-4-1 (second place) in the PacWest. Nesic was the conference Player of the Year despite missing several games because of injury. Phillips was the conference Newcomer of the Year. The ’Lopes, seeking their first trip to the Division II playoffs, have added Division I transfers Melanie Johnston (midfielder, Washington State University) and Kelli Woodard (defender, University of San Francisco). ● Home opener: 5:45 p.m. Sept. 17 vs. Dixie State College. GCU returns 14 players, including career digs leader Laurann Durbin, from a team that finished 10-19 overall and 5-11 in the PacWest. The Antelopes are picked by conference coaches to finish sixth in the 10-team conference this season. ● Home opener: 6 p.m. Sept. 8 vs. Montana State University at Billings in the GCU Invitational. 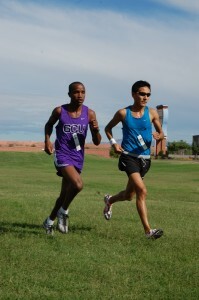 Senior Kip Mutai returns after finishing third in the PacWest meet, where he covered eight kilometers (4.96 miles) in 24 minutes, 51.7 seconds. A key addition is Arizona state champion Brandon Kocmoud of Sunrise Mountain High School, who has run 5K (3.1 miles) in 16:02.3. The men’s and women’s teams have a new home course, Estrella Mountain Regional Park in Goodyear, which will host the PacWest meet on Oct. 29. Both GCU teams finished fourth in the conference last year. ● Home opener: 8:45 a.m. Oct. 8 in the GCU Invitational. Four transfers join the Antelopes, led by Monique Belmudes of Clayton State University (Ga.), who has run 5K in 19:46.6. Juniors Megan Young and Joy Hulsey lead the returning runners. ● Home opener: 8 a.m. Oct. 8 in the GCU Invitational. looks like an action packed season to come for The Antelopes, looking forward to some great results this year!